By signing up, you agree to the Kindle Store terms. This subscription automatically renews at $2.99 per month after the free trial period until cancelled. We will charge your default card or another payment method on file. If you do not wish to continue at this renewal price, you may cancel any time by visiting My Content and Devices. Asimov's Science Fiction magazine has published outstanding short fantasy and science fiction by leading authors for over 30 years. Starting with its January/February 2017 issue, Asimov's Science Fiction updated its annual subscription format to feature a total of 6 issues per year, all of them 208-page double issues. The new format allows for expanded articles and more special features, as well as greater editorial flexibility overall, and comes with no increase in the annual subscription price! 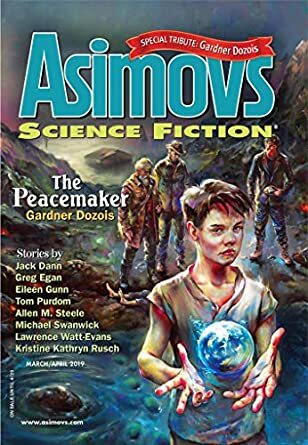 Asimov's is home to many bestselling authors, including Connie Willis, Robert Silverberg, Mike Resnick, Kristine Katherine Rusch, and Stephen Baxter. Asimov's Science Fiction features 6 double issues each year. 1.0 out of 5 starsCannot recommend kindle edition as long as Amazon limits the number of issues in kindle library. This is an excellent source of science fiction literature. Until Amazon admits that fact and quits treating it like a newspaper, I will give it the lowest rating possible. A zero for integrity and customer service would be the most honest rating. I have to keep every issue I purchase on my device, because otherwise Amazon will remove them from my library after I acquire 7 issues. It may be a funny concept for Amazon, but when I buy a hard copy of a book, I own it and can place it on a shelf in my spare room and always have access to it when I want it. Why does Amazon believe that I have no right to an anthology of short stories that I've purchased because the hard copy is printed on pulp paper? If Amazon thinks back issues in my Kindle library take up too much room on Amazon's cloud server, then Amazon has to make it possible and easy for me to back up my issues on my computer hard drive. However, I would be content if I was allowed to keep as many issues as I've purchased in my kindle library without Amazon committing the digital equivalent of book burning. 4.0 out of 5 starsPublisher control is more important than reader ease of use. IASF always has good SF but is infuriating to use on Kindle. It formats to printed form so you cannot actually read it on a phone. But if you choose the reflow option it is a pita to navigate to the variety of content. It would be great to read on a pc, but they are too afraid I’m going to steal what I’m paying for so reading on a pc in Kindle is not allowed. 5.0 out of 5 starsAsimov's Science Fiction sets the highest of standards for writing. I am a long-time science fiction fan, since I was about 12. I signed up for Asimov's from the first day, and have never regretted it. The stories are consistently excellent, and many new authors have written for Asimov's. I even submitted a story to them (politely rejected) and may do so again. Many different authors ensure a wide variety of stories, and they are all well-written. I recommend Asimov's to everybody with even a slight interest in science fiction/fantasy. I have been subscribing to IASFM for decades. In fact, I cannot remember a time when I wasn't subscribed to, or reading, this magazine. The variety of fascinating writers, the myriad viewpoints, the scientific reality (and fantastic future inventions) have kept my attention. It always astonishes me that the stories are new and fresh and that writers keep coming up with captivating, thought-provoking, or even funny, new material, month-after-month. Asimov's has launched the careers of many sci-fi greats, and is a keystone in the sci-fi convention culture, right next to Analog. I have a small collection of the hardcopy magazines going back many years, and the only regret I have about an e-subscription is that I don't find random copies lying around on my bookshelves anymore... instead they're in my pocket, on my phone.... awesome bite-sized sci-fi anywhere I go! 3.0 out of 5 starsA disappointment overall but here and there a gem. Too many of these stories seem a stretch to fit the science fiction genre. I would have expected better. There's a lot of information on what's going on in the scifi world, but I don't care much about that stuff. However, now and then there's a gem that makes the subscription worthwhile. I used to regularly buy this on paper at the "news stand". The number of things that are no longer fiction have changed SciFy, but Asimov's still publishes great new authors. Not every story is a thrill, but that was always true. So, for me, this is still a great read. I got Asimov's Science Fiction as a lark because I like sci fi novels and was curious about what was happening in the world of science fiction short stories. These stories are well-written. Some are very funny, others are poignant, all are imaginative. Overall I found them superior to the predictable, dull short fiction I find in many literary magazines these days. All these stories contain a charge. Very well worth reading. In particular, I suggest the magazine for anyone with a daily commute who needs reading matter--the stories are just about the right length and would definitely liven up the half-hour on the bus or train.